Dohuk (Iraq) (AFP) - A jihadist fighter slits a man's throat, another brandishes a severed head spiked on his rifle while more militants dump bodies into a trench overflowing with corpses. This is how painter Ammar Salim depicts the massacres the Islamic State (IS) jihadist group perpetrated against his Yazidi minority in northern Iraq last summer. 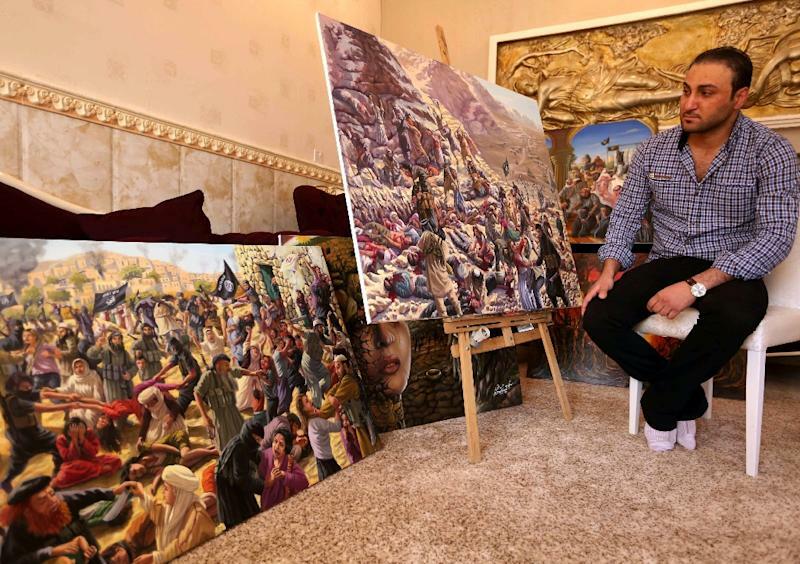 In his tiny apartment in the city of Dohuk in Iraq's Kurdish region, Salim has attempted to put the collective memories of his community to canvas in a series entitled "The Yazidi Genocide". This particular piece, his most recent, includes more than 100 characters and was inspired by mass graves found in the Sinjar area. "Most people fight through weapons, writing, or the press. I said I'd fight through art," Salim says. "I want people to see what they haven't seen." The paintings, including many crowded and colourful scenes reminiscent of Renaissance depictions of hell, are intentionally shocking. One work depicting the fall of Sinjar shows women being raped, killed, and carried away. Another presents cackling jihadists buying and selling Yazidi women in the city of Mosul, their main northern Iraqi hub. Salim fled the town of Bashiqa when IS fighters took over Mosul in June 2014 in an onslaught that overran large areas of Iraq. During a second offensive in August, the jihadists targeted areas in the north that were home to many of Iraq's minorities. The Yazidis, who are neither Muslims nor Arabs and practice a unique faith that makes them infidels for the jihadists, were hit harder than others. 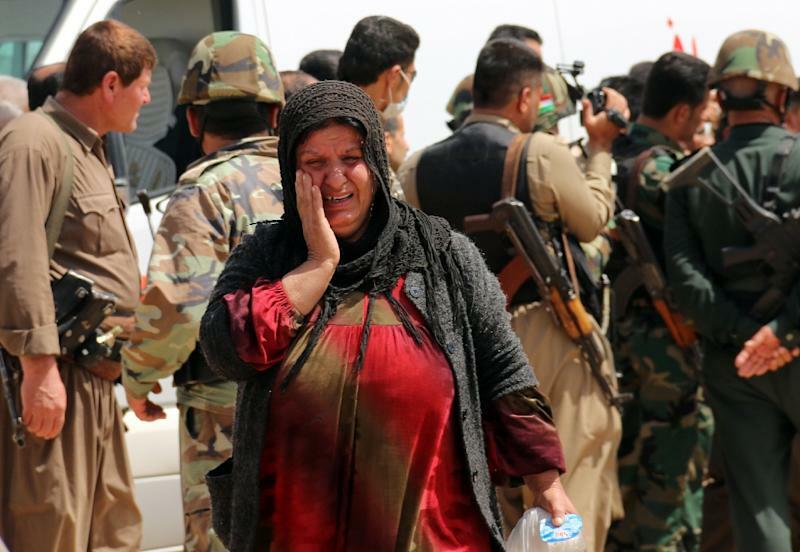 They looked in danger of being wiped out of their ancestral land until a US-led air campaign turned the tide on IS advances in northern Iraq. Salim has been painting since he was a child and had his own workshop in Bashiqa, where he says he left tens of thousands of dollars worth of work when he fled and which has since been destroyed. Much of his oeuvre includes innocent statues depicting cartoon characters such as Popeye and Mickey Mouse, and work he did as a set designer for children's plays. But there are also darker pieces, such as the one he painted in 2007 about former president Saddam Hussein's Anfal campaign against the Kurds that left tens of thousands dead. It features a face, burnt almost to a crisp, looking to the heavens as a beam of light streams down through a hole in the clouds. On the ground lies a mound of skulls. Portrayals of trauma have been part of Iraqi visual arts for some time, says Nada Shabout, an expert in modern Iraqi art at the University of North Texas. "Iraqi art from the beginning of (UN) sanctions through the 1990s and the 2003 (US-led) invasion has often dealt with current issues that expressed anger and pain," she says. "When you have a stable life you can give beauty," Salim says. "When you are in such a miserable life, you have to talk about what's inside you." The culmination of this trauma has led not only to Salim's portrayals of IS militants but also more fantastical manifestations of suffering. In one painting, which he describes as "a forest of hell," he depicts a road leading to the Yazidi holy site of Lalish. The trees lining the road, linked to each other by chains, are shaped like women crying out to the heavens. The background is a blood-red sunset mixed with burnt oranges and yellows. 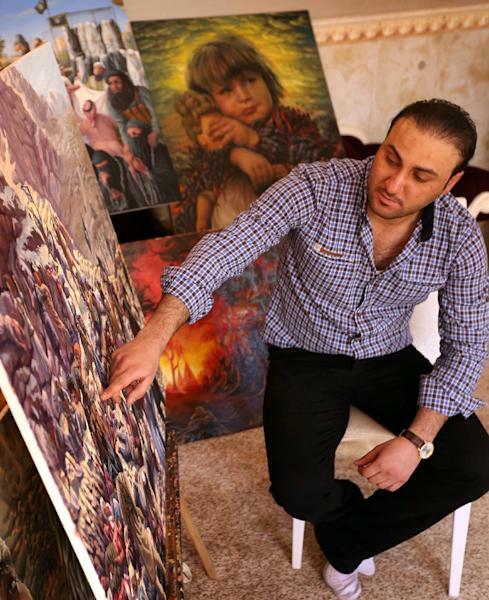 Asked if the pain and suffering in his paintings has become a key part of Yazidi life, Salim says: "It has become all of our life." The series so far consists of seven paintings, but Salim hopes it will eventually grow to include 20 pieces. Salim says the next piece will depict a woman picking the bones of her dead daughter out of a mass grave, while her other daughter picks jewelry off the body. "I'm talking about the rights of Yazidis and the killing of Yazidis and the genocide of Yazidis," he says. "In the future, they'll never forget what has happened to them."